5 reasons why do we think intersection of art & tech is so popular nowadays. What is art? A fundamental question. For us, art is a kind of communication channel, letting artist on one side and his/her observers on the other side communicate thru all of 5 human senses. Art is not only about conserving beauty in time, but also about creation and destruction in the name of interaction – a specific talk - between artists and audience. 1. happening: by which we mean the performative side of art. We like that art & tech combinations trigger an immediate action and reactions of people involved. We don’t know about other countries, but Slovaks seems to be a little bit shy when it comes to „trying something out in front of others“. That is why we appreciate this kind of communicative media. It leaves people some space to be part of a project and we simply like that idea! As an example I will put here the “Sound map”, which reacts to the tone of your voice. You find yourself in role of a little God as you are the only one who creates the landscape in this interactive installation. 2. playfulness: seeing people react to sense thriving contemporary art projects is priceless. Everyone is still a little kid inside, and this kid would like to go for a short walk from time to time. Life is too short to be frown all day long. It’s time to be amazed! 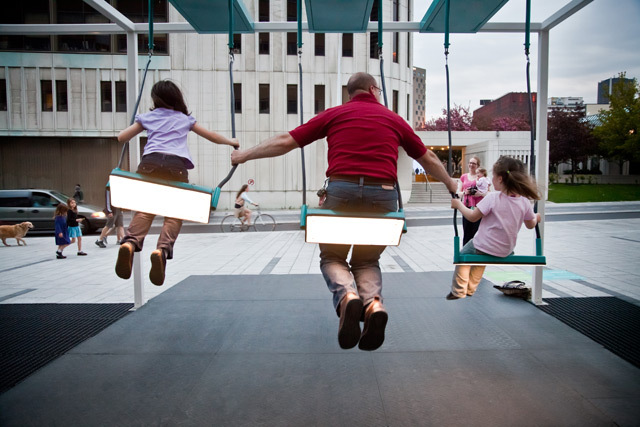 And this “Swing music installation” shows us it is still possible. This combination of art &tech gives people the right joy out of it. 3. to join and create a bond: participantion is important. You can either interact with the installation or artist himself, as an observer or a part of group, or even if you think you are not participating, you still do. As a participant you open your mind and heart. To join and create a bond is something that connects us not just as people, but also on a higher level of conciousness. 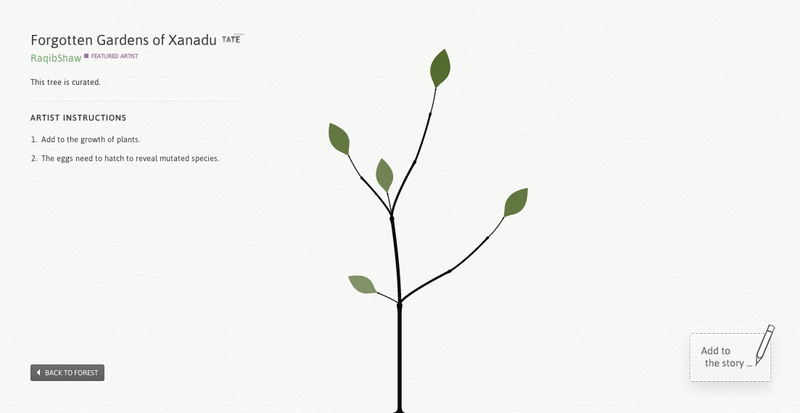 The good example to this is „The Exquisite Forest“ – online interactive collaborative project by Google and Tate Museum. Your contribution affects the final form of the artwork. This is what internet allows. It is really only up to you how you decide this art & tech combination project should evolve. 4. nonconformity: where are borders between art styles? What is a style exactly? The emerging field of art & tech results in unique contents effectively brought to all of us. This is dragging people out of their comfort zones and makes them think. It is not about neverending circle, it is about uniqueness. „Out of bounds“ is a project dedicated to finding new worlds thru the x-ray oculus. It lets people to think out of their everyday life. 5. uniqnuess and beauty: there are no mistakes in interpretation of project. You are always right. No black or white, hot or cold. The perception is what makes it more or less beautiful. And we need to learn to use that perception. Every creation of mind in a matter of art intention is beautiful. Artists are showing that everyday situations and things can be made pretty only by adjusting the angle of your perception. 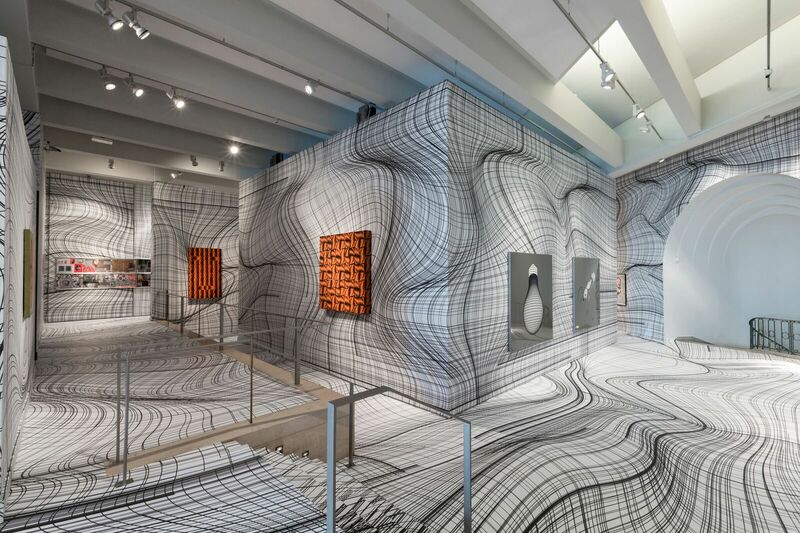 Shape-shifting installation by artist Peter Kogler, where he plays with your perception and illusions.